I use Aleene's Tacky Glue for 90% of all the model building I do -- I even occasionally sneak it in when I'm supposed to be using Titebond II for a model railroad client. He'll never know the difference. I've been meaning to try Zip Dry Paper Glue, which has no water (and which therefore can't warp paper) but the price puts me off. $9 at Michael's for a small bottle! Also, it's notorious for drying up. Apparently people find half-empty bottles in the store because if it doesn't get used, it evaporates. I own, but haven't used, a tin of Coccoina paste. Supposedly, it smells like marzipan. I sniff at it and smell absolutely nothing at all; my wife takes a whiff and recoils in horror at how astringent and awful it smells. Anyway, the tin looks gorgeous in my workspace. I may try using it when I need to laminate some paper. Ooo Waddy! I haven't seen the Aleene's Acid Free Tacky before. Cool. The only thing I've added now to my collection is some BSI (Bob Smith Industries) brush on CA glue. Similar to the purple bottle you have there, but a tad thinner, and obviously it has a brush applicator. It works great for reinforcing weak parts like landing gear. 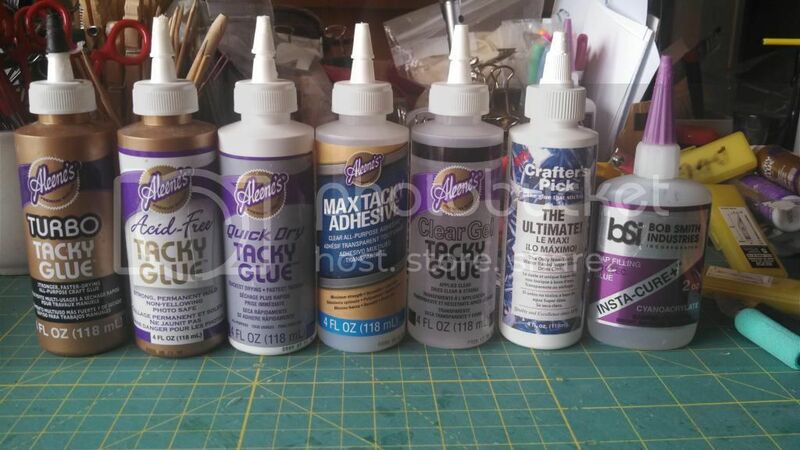 Other CA glues I have used(Krazy Glues)in small tubes or containers dries up before I can use very much of it. I had a medium-sized tube of Gorilla Glue cyanoacrylate glue in my tool box for the longest time. I needed it the other day and it was fine. It may become my go-to brand. I've used Minwax wood hardener to stiffen paper by brushing a little on the back. Has anyone tried UHU Contact Cement Stick? I want to try some for laminating. The Paper Modelers site is doing a thing on laminating now that sounds really neat (haven't had a chance to try it yet). Anyhoo, a Russian fellow came up with the idea of laminating card stock and paper by ironing a piece of plastic wrap between the sheets, ie, using the plastic wrap as the glue. Apparently it works pretty well, and people are trying all sorts of other things, like garbage bags, vegetable bags, and other such stuff with different mil thicknesses. Use a pretty warm iron and no steam. Basically what they are doing is taking a piece of scrap as a backing pad, putting the back of what they want to laminate on that. Then the plastic wrap followed by the piece you want to laminate with another piece of scrap over that. The scrap protects the ironing board and the iron from the melted plastic, the stuff you want to laminate is just between the scrap. This will give you a nice smooth consistent laminated piece. Hey its worth a try. I just found some small Aleene's Tacky Glue pens at a Tuesday Morning store. One of them was about 2 1/2 inches long, and it's great for my travel tool kit -- sometimes to get out of the house, I take a model out to the coffee shop and work on it there. One of the tacky glue pens had some odd, thin, runny formulation of the glue, and another had the standard Aleene's white glue. I decided to empty out the smallest one and refill it with the standard Aleene's. I struggled and struggled to get the nozzle off. When I finally managed to pop it off with a pair of pliers, I realized the threads were backwards. That's a pretty clever trick to keep consumers from refilling your containers. Harumph. Anyway, they work pretty well. They deliver a thin line of glue that's just about right for tabs.